As a stairway accident claims attorney in Los Angeles , CA, I can tell you that stairs are one of the most dangerous areas of any type of commercial or residential property when there are dangerous conditions caused by defects, poor construction, or inadequate maintenance. A fall down the stairs can be very serious, and it happens on a fairly frequent basis. The problem is so widespread because pedestrians experience accidents on indoor stairways as often as they do on outdoor stairways. According to the National Safety Council, 12,000 people lose their lives each year in stairway falls, and approximately one million more sustain injuries. As a matter of fact, only motor vehicle collisions cause more injuries than stairway falls in the United States. In clinical studies, scientists learned that people tend to only directly observe the first three and last three steps of a stairway. Generally, they do not watch as carefully when they are navigating their way down the middle. The conclusion was that builders must pay particular attention to the first three and the last three steps. To help builders create safer steps, researchers suggested that adults must be able to place the balls of their feet squarely on the tread of a step. A person’s foot must not be able to hang over the tread or else the pedestrian could misjudge the size of the step and fall forward. In this type of incident, the pedestrian does not have enough time or space to recover his or her balance. In order to improve the safety of Los Angeles stairways, authorities examined the evidence cited above and strengthened the building code to ensure that every stairway in the city meets the highest standards. For this purpose, they require steps to contain risers that are no higher than seven inches. In addition, horizontal treads must be at least 11 inches. These dimensions specifically help to prevent forward falls. Regulations also require each successive step to have the same measurements as the last. Furthermore, a stairway that is to have more than 12 steps must include an intermediate landing. Lastly, surfaces on the steps and the floors must be slip-resistant. The Lack of Maintenance: Although the building code was updated to ensure stairway safety, improper care can result in injuries anyway. For example, steps can become damaged and present a danger if they are not fixed right away, but sometimes, building owners neglect to have these repairs done. If you slipped and fell because of faulty or damaged stairs that the owner knew were there, the owner can be held liable for your injuries. 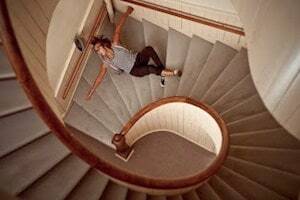 Inadequate Lighting: Injuries also occur because stairways do not have adequate lighting. The risers and the treads could have met the above-mentioned required dimensions, but if you couldn’t see the steps clearly, this could have directly caused your fall. In some cases, building owners know that this problem exists because several people filed claims against them for the same reason. However, they continued to fail to address the problem. Therefore, you can file a complaint against these owners as well. Faulty Handrails: Handrails are put in place for pedestrian safety because they prevent people from falling over the side and toward the floor. They also help people maintain their balance as they walk up or down the steps. However, handrails can become a perilous feature when they are allowed to fall into disrepair. They may also have been constructed poorly. In these instances, pedestrians have an increased likelihood of slipping or tripping, and the owners must be held accountable. Improper Maintenance: Stairways require maintenance, but some building owners fail to perform this very important duty. As people use the stairs over a long period of time, the safety features can wear down. Therefore, building owners must inspect these areas to make sure that everything is in working order. When repairs need to be done, they are obligated to complete them. For example, step treads must not be loose or missing, and the carpet must be in good condition at all times. If not, a hazard exists because the owners failed to administer proper care. Property owners of both residential and commercial property are required under the law to maintain a safe environment for customers and guests. If they do not, the injured have the right to pursue monetary compensation for their medical bills, lost wages and pain and suffering. The first step toward this outcome is to hire a Los Angeles personal injury attorney. In order to demonstrate that the owner of the home or building was liable for your injuries, your attorney will seek to learn when the hazard presented itself and when someone informed the owner that it existed. Your lawyer will find out if the owner ignored the information that was given to him or her and allowed the hazardous condition to remain in place. Your lawyer can also present evidence that states the owner should have known about the danger and did nothing to eliminate it. Property owners can also be held liable when people die after they suffer an accident on a stairway. These are called “wrongful death” claims, and they are civil lawsuits that must meet the same burden of proof as a claim filed on behalf of a living plaintiff. In this case, the deceased person’s survivors will file the lawsuit, and this list may include the deceased person’s spouse, domestic partner and children. The deceased person’s stepchildren, parents, putative spouse and the children he or she had with the deceased can file a wrongful death lawsuit if they can demonstrate that they were financially dependent upon the deceased.